Gili Air is the most easterly of the three Gili Islands off Lombok. Of the three Gilis, this is the island closest to Lombok. With Gili Trawangan rapidly becoming famous as a party island and Gili Meno primarily catering to couples who want to have their space, Gili Air with its relaxed pace of life attracts social backpackers who prefer to dive, meet other fellow travellers or simply want to chill out. Quite a number of partygoers after being tired from having crazy nights on Trawangan move over to Gili Air to do their dive courses in peace. 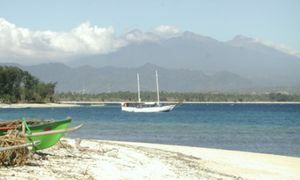 The island still has more of a rural, established feeling than the other two, and it is no surprise that many locals seem to prefer living on Gili Air, and that it has the highest permanent population of about 1,800. Most of the accommodation and other tourism facilities are on the south and east coasts, facing Lombok. The boat landing is in the centre of the south coast. A coastal path leads you around the perimeter of the island, and a leisurely stroll all the way around will take about 90 min. For such a small island, the maze of paths that criss-cross the island can get surprisingly confusing, but these always lead back to the coast path eventually. See Gili Island main page for more info. The sea is calmest in the morning and all transport stops running in the late-afternoon, well before dark. During periods of southerly winds and in July and August especially, the swell can be a bit hairy and you are very likely to get wet on the crossing. It is advisable to place laptops, cameras and handphones in waterproof bags for the crossing. You will need to wade through shallow sea when disembarking, so wear either appropriate footwear, or none at all. Prices can vary depending on the Season and travel agent or hotel selling tickets so it might be worth shopping around. Normal prices are Rp 300.000 to 600.000 (one-way) and Rp 1,300.000 (return) max in High season .So WATCH OUT and don't pay more than this ! !There is a lot of people overpaying for this service without a proper check before buying the tickets in Bali or checking online directly with the Boat Company. Marina Srikandi  : The first operator to the Gilis. This company has been in operation since January 2000. Daily crossings from Serangan and Padang Bai. Free Pick up & Drop Off Shuttle Service In Bali Selected Area. Depart from Serangan & Padang Bai everyday. First departure at 8.30 Am & Second Departure 1.00 Pm from Serangan. Depart from Padang bai everyday. First departure at 10 Am & Second departure at 1.00 Pm. Eka Jaya Fast Boat :One of the most reliable boat service companies in Bali capacity of 118 Seats, Air-Condition and Tv . Free Pick up & drop off area : Ubud, Kuta, Seminyak, Legian, Jimbaran, Sanur, Nusa dua, Denpasar Airport, and Candi dasa. Hotel Pick up : 2 hours or 90 minutes before departure time. Depart from Padang Bai everyday at 9 Am and 1 Pm. Mahi Mahi Dewata :All trips include hotel transfers in Bali area, insurance, buffet morning coffee/tea prior departure and mineral water served on board.Departs Padang Bai.Departs from Padang Bai at 9.30 Am. Amed Sea Express offers a twice daily high-speed schedule to Gili Air from Amed on the East coast of Bali. Boats depart Amed at 10AM and 3:30PM with arrivals on Gili Air at 11:30AM and 5PM. Scoot Cruises also now departs from Sanur in Bali and stops in Lembongan, Lombok and Gili Air. Gili Getaway (formerly Island getaway) go directly to Gili Tawangan but offer a transfer service to Gili Air as soon as you arrive. Public boats depart from Bangsal between 8AM-5PM but often no later than 4PM and are fewer in number than go to Gili Trawangan. The voyage takes about 30 min and the official price is Rp 12,000 (as of December 2016). The public boat only depart when there are enough people, which means a minimum of 38 people. If numbers are insufficient you may have to endure a long wait at Bangsal. The best time to be sure of a crossing to Gili Air is 2PM-3:30PM in the afternoon however this can vary, especially with weather or passenger loads. From the Lombok International Airport by taxi is about 247,000 around 2 hours if it's a "normal" driver, there are a few taxi providers before you step out of the airport gate. Buy your tickets direct from the official Koperasi Angkutan Laut Karya Bahari office. In Bangsal this is located inside the main building near the door at the eastern corner. (Sep 16 - the ticket office for Gili Air is on the right as you are looking at the sea. Down the back of the biggest building that says Tax servixe. This is not a scam). The Koperasi operate the Public Boat, the Shuttle boat, the Island Hopping boat and also offer (official) Charter boats. The office lady still encourage you to buy the rest of the tickets to ensure that you depart on time, but actually it fulled within half hour with locals (by the time I took on April 15th 2014). 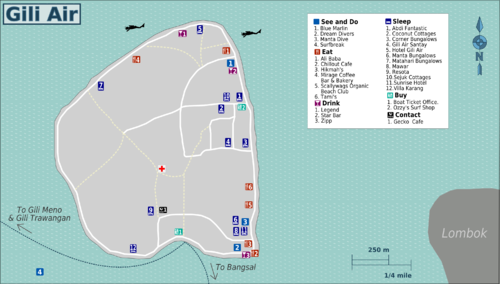 There is a ticket office on Gili Air to buy your ticket back to Bangsal, it is located adjacent to the arrival and departure point. This is the standard method to reach Gili Air and is used by both local residents and tourists. The maximum number of passengers is fixed at 38 persons but it is often overloaded with goods and or passengers. If it seems clearly unsafe due to either overloading or prevailing weather conditions then it is most likely best not to board it. This service supplements the Public boat (ferry) service. Bangsal to Gili Air departs at 5PM, the official price is Rp 26,000. Gili Air to Bangsal departs at 8:15AM, the official price is Rp 26,000. (This is more expensive than the standard Public boat cost officially fixed at Rp 8,000). The official charter boat service provided by Koperasi Angkutan laut Karya Bahari is permitted to carry a maximum of 12 persons. Informal and unofficial charters are also available from private operators to travel from Bangsal to Gili Air. If requiring one try to deal only with the boat operator, ignore the touts and 'facilitators' and use your time over a negotiation, any hint of haste or urgency is sure to raise the price. Perama  has a small office on Gili Air next door to Villa Karang, and they offer daily transfers from Senggigi at 9AM for Rp 90,000. These should not be relied on outside of the peak tourist season though. Perama is unlikely to take you to Gili Air if you are the only passenger. Departing from Bangsal to either of the three Gili islands is rarely pleasant due to the very persistent touts who infest the place, just try to ignore them and do not listen to their generally fanciful tales that involve you paying them money to solve an imaginary transportation problem. They often provide a chorus of gloomy predictions regarding the alleged unavailability of services, then if successful they just place unknowing passengers upon the normal scheduled service or a private charter at an often seriously inflated prices. The situation arising from the activities of pestering touts combined with confusing and inadequate formal services at Bangsal is the source of many disappointments and complaints. To move from one island to another the formal procedure is to take the Public boat (ferry) to Bangsal and then a further similar ferry to the required island departing from Bangsal. To return the reverse is required. This can be confusing and co-ordinating the timing with the connecting boat departing from Bangsal may be either difficult or elusive. There is also a limited official inter-island Island Hopping service provided. The tariff for all Koperasi Angkutan Laut Karya Bahari services was last set by decree of the Regency of West Lombok in May 2008. This koperasi now falls under the new jurisdiction of the Regency of North Lombok. Departure and arrival times may vary due to operational conditions and other random factors such as loading times and delays arising from waiting for sufficient numbers of passengers prior to departure. Overloading may occur and caution should be exercised if considering boarding or travelling on an overloaded boat. If there are too many people requiring transport they may be left behind and a substitute service may or may not be available. Try to limit your dealings to official koperasi personel only and avoid entering into any discussions or negotiations with local touts and facilitators. Only a few of them will be of any assistance at all and most will endeavour to confuse the traveller so that they accept an inflated price for the provision of an existing service. Do not buy tickets from anyone other than an official ticket seller. A limited formal Island hopping boat service is provided by Koperasi Angkutan Laut Karya Bahari, this is the same local koperasi (maritime transport co-operative) that provides the Public Boat ferry service. Listed price should be 35,000 Rp. These departures may be affected by weather and quantity of passengers, so it is always advisable to arrive at the beach early and also to be prepared to wait for delayed departure. Informal private charters are also available. Prices are subject to negotiation, take your time over the process. Walking is the best option as you can wander around the whole of Gili Air in about 90 minutes. Bicycles are widely available for rent for Rp 30,000-50,000 per day. Some hotels might give you one as part of your accommodation package. Be warned, however, that some of the roads are in poor condition - little more than sandy tracks - so there will be times when you need to push, or even carry, your bike. Cidomos are available along the harbour, but they have become quite predatory and will lead you to believe you need one to get to your destination. Most guest houses can be walked to if you don't have heavy bags. Negotiating seems to have gone out the window and depending to the distance roughly charged from Rp100,000 to Rp200,000 for one trip - this can be expensive if not travelling in a group. There are 10 dive operators with offices on Gili Air. Most of them are independently run outposts of Gili Trawangan based shops. All dive shops offer a full menu of PADI or SSI dive courses and fun dives. If you intend to learn to dive or advance existing qualifications and wish to avoid all the temptations of partying whilst doing so, then Gili Air is the ideal base. Freediving, breath-hold diving or apnea, is a form of diving where a person relies on his or her ability to hold their breath. With an abundance of dive sites and warm, clear waters, Gili Air is the perfect place to experience the amazing and fast growing sport of freediving. Although diving on a single breath of air may sound difficult, you will be amazed what an experienced team of freediving instructors can do for you in just a few days. By applying the correct techniques, together with informative theory and practical water sessions, you can experience new sensations and realise the natural ability of the human body to dive to depths you previously thought impossible, on just one breath! Any of the dive shops will also be able to organise snorkelling trips for you, including hire of gear. Alternatively, there are some good spots where you can snorkel from the beach. Try almost anywhere along the east coast where the fringing reef is fairly healthy and close offshore. Be careful walking in the shallow waters though as there are a lot of very spiny sea urchins in amongst the sea-grass. Equipment can be hired from almost any cafe or shack close to the beach for about Rp 30,000, or your hotel will be able to help you. Please note, the coral reef is a sensitive ecosystem, when snorkeling please swim rather than walk over the shallow reef; will be surprised how much is growing under you, as a rule of thumb, as soon as the water is up to your knees you are safe to swim. Gili Air hardly registers a blip on the global surf scene, which is somewhat surprising. There is a poorly known, barreling right hander off the south coast called Playgili. This is by no means a straightforward wave, breaks over some very sharp coral and is best left to experienced, skilled surfers. It does not always roll, but when it does this is a good wave. Best first stop for any surfer is Ozzy's Surf Shop, where the local crew will be keen to rent you a board and chat about the conditions. The circular walk around Gili Air is very pleasant indeed. The highlight for many would be the awe-inspiring views of massive Mount Rinjani towering over Lombok. There is an ATM outlet of CIMB Niaga bank on the island. It is located a few dozen meters up the main road from the ferry arrival area. There are two terminals inside, the one which dispenses Rp 100,000 notes allows up to Rp 3 million per transaction from any Visa/MC (no extra charges). A second ATM can be found further north on the same main beach track past the Turtle Beach hotel. These are the only two on the island but are generally reliable. The best bet for changing money is Oseana shop located in the Harbour. Oseana shop will change a lot of different currencies. Ideally, make sure you bring enough cash with you that is already converted to Rupiah. There are a few shops selling basic necessities close to the boat landing and on the eastern coast. In the same area there are also a couple of vendors with a reasonable collection of Lombok handicrafts for sale. In the centre of the island (in the village, on main north-south road of the island), there's a bigger shop (they have lots of smelly dried fish), selling, besides other things, some cheap foods (try donuts for Rp 1,000 if you are not afraid). Slightly cheaper than beach shops, but some sellers try to compensate for that when see foreigners, so the same 1.5 lt bottle of water could easily cost Rp 5,000 one day and Rp 4,000 the next one depending upon where you purchase it. Starting at the jetty and working your way north on the east side of the island up to Hotel Gili Air, there are lots of decent places to eat. Since there is no fresh water on the island, purified shipped water is the norm, which does not mean that salads are 100% safe, but the food is generally not problematic. Many restaurants propose delicious grilled fish, freshly caught from the ocean. Choose the fish from their display stand and discuss the price. Local cooking style normally tends to overcook the fish, so it is a good idea to specify your cooking taste. For budget travellers, there are several warungs in the village, just go inland from the harbor. Nasi campur spesial (with chicken) is Rp 10,000, as well as soto ayam. There's also a place selling bakso and (sometimes) martabak a bit further inland, almost in the middle of island. Rp 10,000 for bakso, opens in the late afternoon. Gili Air usually has one party a week rotating at different bars during the peak season only. Locals and restaurant owners will usually mention them to you, and sometimes flyers are posted around. The party scene on Gili Air is much more low-key, and not nearly as rowdy as the wild all-nighters on Gili Trawangan. For those who want really cheap accommodation (Rp 50,000-100,000), the good option is to walk by the road going inland from the harbor/boat ticket office to the village. There are several homestay-type accommodation options there. In low season, the price can often be bargained down. Gili Air budget hotels tend to bear a striking resemblance to one another and most are on the east side of the island. There is not a wide range in quality or appeal, although a few stand out. Villa Casa Mio (formerly Sunset Paradise), (west coast), ☎ +62 370 646160 ([email protected], fax: +62 370 649330), . checkin: 3PM; checkout: 11AM. Quiet beach, 4 beach houses/cottage, each with different theme and design. All have cold/hot running water from Lombok, open air bathroom (some with massage shower) and friendly service. Free wifi in all rooms. The islands electricity system has been gradually getting worse since January 2015. Daily power outages of between 20 mins and few hours are not unexpected and can occur several times a day. Most of the more upmarket accommodation have generators to nullify this problem but it maybe an issue if staying in the more basic accommodation or inland. Bring a head torch! Large number of places on Gili Air advertise free WiFi although many of these are painfully slow and unreliable. Most rely on a 3G sim card in a router. A few places advertising "high speed" fibre are still very slow and over subscribed. On Gili Air, the best option now is to buy a SIM card for your phone, tablet or laptop. XL is the only provider that has a 3G/HSDPA mast on the island and data coverage is good over most of the island. Telkomsel/SimPATTI has almost no data coverage except on the west facing beach via its mast on Gili Trawangan and the other networks have no presence at all. SIM cards and data packages can be purchased on the island at Siti Shop and various other places. Expect to pay approx 55,000RP for 1.5gb a month all day access and 1.5gb 0000-0600 internet on the HotRot package. Beware of so called "Unlimited" and "Super Unlimited" packages as these are in fact limited. The Super Unlimited for example has a monthly allowance of 8GB for 99,000RP. These packages can be bought again and renewed if a limit is reached. Speeds are highly variable ranging from 1MBit or so in the middle of the night to large periods of time where even simple web browsing is impossible during the daytime and public holidays with XL Axiata. Throughputs of sub modem dialup speed on 3G are not uncommon in the afternoons at times. It's worth noting that a lot of the advertised packages have time of day restrictions meaning you can only normally use half of the figure quoted during normal hours and the rest between midnight and 6am. This is particularly true for the most popular HotRod3G services. The XL data network can and does go down without warning sometimes for large periods of time so don't rely on any internet being available if you have something important to do and a time constraint - best off going to Bali! SimPatti, Three and Indosat do not have masts on the island so signal coverage with them is patchy and data coverage is limited to only a few parts of beach facing directly Lombok or Gili Trawangan. Hop over to Gili Meno for further seclusion and a real desert island experience. Back to Lombok and Mount Rinjani for one of the best climbs anywhere in Indonesia. Bali per Fastboat depending upon the weather conditions. there are many service agents on the island, to offer you more service to leave or arrange the trip, they could arrange your trip from a pick-up service at your stay all the way to the airport or anywhere I believe. a charter car(private car)instead of a taxi from Bangsal to the airport was Rp 300,000 on April 15th 2014. There's also a shuttle bus around Rp 250,000, will take you from Gili Air through Senggigi to the airport, cheaper but takes longer. This page was last edited on 8 June 2018, at 01:13.